You might want to eat your lunch before watching this video. It could put a dampener on your appetite. That is, unless your taste buds are a fan of scales! Posted by Mrs Weird Scientist in Easy As Pie, Human Body, Nutrition and Health. Just how hot do you like it? It’s not the weather I’m talking about! I’m talking about your food. Lots of stuff can add a little – or a lot – of bite to your food but chile peppers are one of the most well known plants for giving food that extra something. For many of us, that extra something is a well tolerated pinch of heat but for others, it’s an intensely enjoyable, spicy burn that we relish in many of our favorite cuisines – from Mexican to Indian food, among others. Researchers at New Mexico State University have discovered the world’s hottest chile pepper. Named Bhut Jolokia, it originates in Assam, India and has received the title of the world’s hottest chile pepper by the Guinness Book of World Records. Dr. Paul Bosland of the Department of Plant and Environmental Sciences collected seeds of Bhut Jolokia when he visited India in 2001. For three years, he grew Bhut Jolokia plants so that he could sample enough seed to do the necessary field tests to check out the heat rating of the chile pepper. You might be wondering how researchers figure out which chile pepper is the hottest? Well, check this out – they use something called Scoville heat units (SHUs). 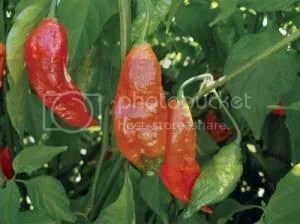 Bhut Jolokia got a score of one million SHUs while the Red Savina, which is the previous holder of the world’s hottest chile pepper title, only scored a measly 577,000 SHUs. Mind you, the Red Savina is still very hot! Discovering hotter chile peppers means that food manufacturers and others involved in the industry can use less chile peppers to give foods a kick. So, a hotter chile pepper can be much more cost effective. If you’re anything like me, you enjoy spice and heat in your food – perhaps just enough kick to give a bit of sting to your throat and a glimmer of sweat on your face. Still, I’m quite certain that Bhut Jolokia is capable of a lot more heat than my throat, taste buds and entire body could ever handle! Lets hope the food industry uses this chile pepper wisely!